My General Tso’s Tempeh recipe is sure to satisfy your takeaway cravings! 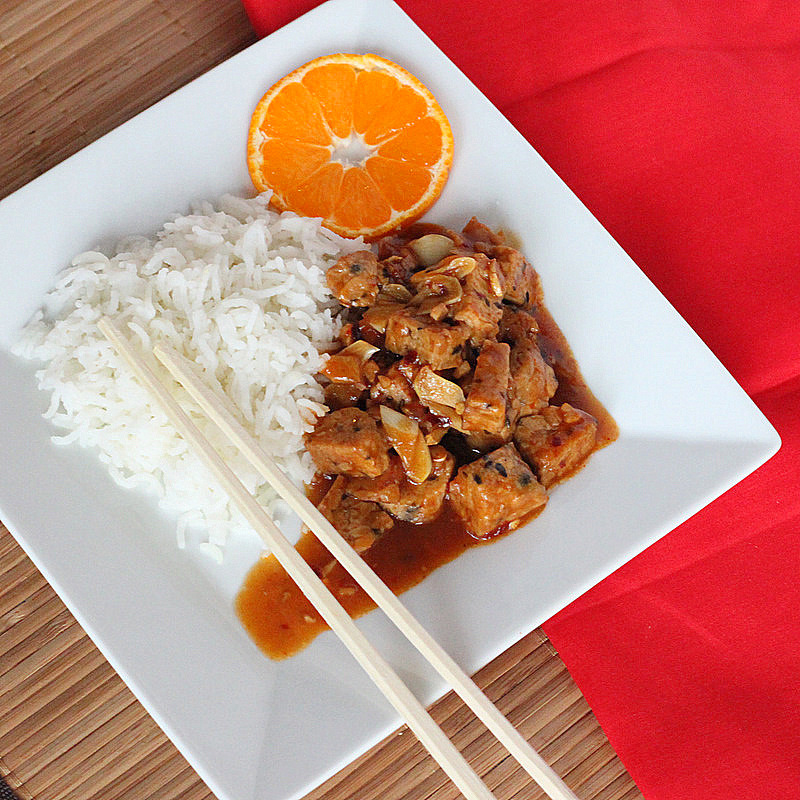 This is non fried version of the General Tsos saucy Tempeh with a citrusy twist. Add some blanched Broccoli or bok choy to it for a bigger portion and some greens. You know who reads my blog on her Iphone these days? My mom! She has one from her visit here in october and she is adept at all things I- … Ipad, Iphone. She reads the blog and gets her own creative ideas and makes things.. She saw my Naan post and made some with baking powder, yogurt and whole wheat flour and surprised Dad! I usually either marinate the tempeh for a few hours or cook it in broth, for a more flavorful result. 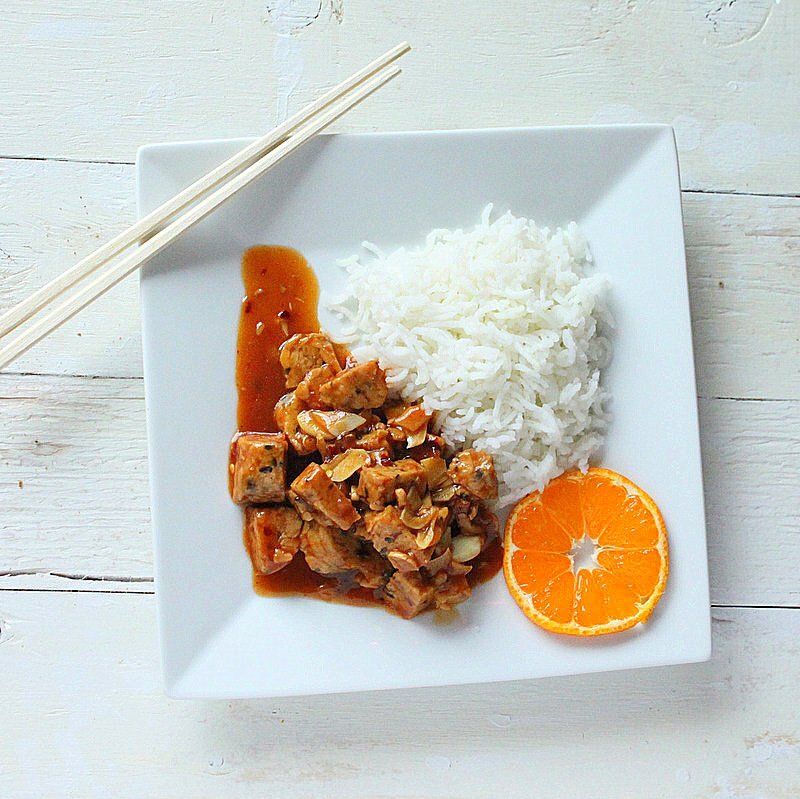 Tempeh and soy sauce or other sauces can have gluten. Use glutenfree version to make it gf. You can use Tofu or bean patty cubes instead of Tempeh. Also, Thank you Laura from GlutenfreePantry for the Liebster award! Some other versions to help use Tempeh to sub meat.. Try the Tempeh Seekh Kebab patty, its a long recipe, but with all the spices and crumbled tempeh, there is no beany taste or texture! Or Try some of the Indian curries like Kadhai Tempeh and Cauliflower. My General Tso's Tempeh recipe is sure to satisfy your takeaway cravings! 1 Tablespoon (1 Tablespoon) cornstarch mixed in 1/3 to 1/2 cup of water depending on your preference of quantity and consistency of sauce. Mix well and cook covered on low heat, until all liquid is absorbed(12-15 minutes).You can also marinate the tempeh in the mix for half an hour before cooking. In another medium pan, add 1 teaspoon of oil and heat on medium heat. Add the cooked tempeh and cook on medium heat for 2 minutes until some sides are brown/crisp. Add garlic cloves, ginger and cook for half a minute. Serve hot with a cup of white or brown rice, topped with chopped green onions/scallions and a slice of mandarin orange. The recipe can be easily doubled or tripled, add red pepper flakes to taste and you might need more cornstarch to thicken the sauce. 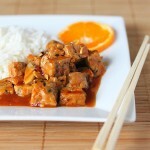 Tempeh recipe looks superb and lovely clicks..
Lovely recipe, never thought of tempeh in tso sauce! Looks really good. Uhm. Do you think your mom would adopt me. I have a blog.And I like your tempeh! This is such a scrumptious recipe! 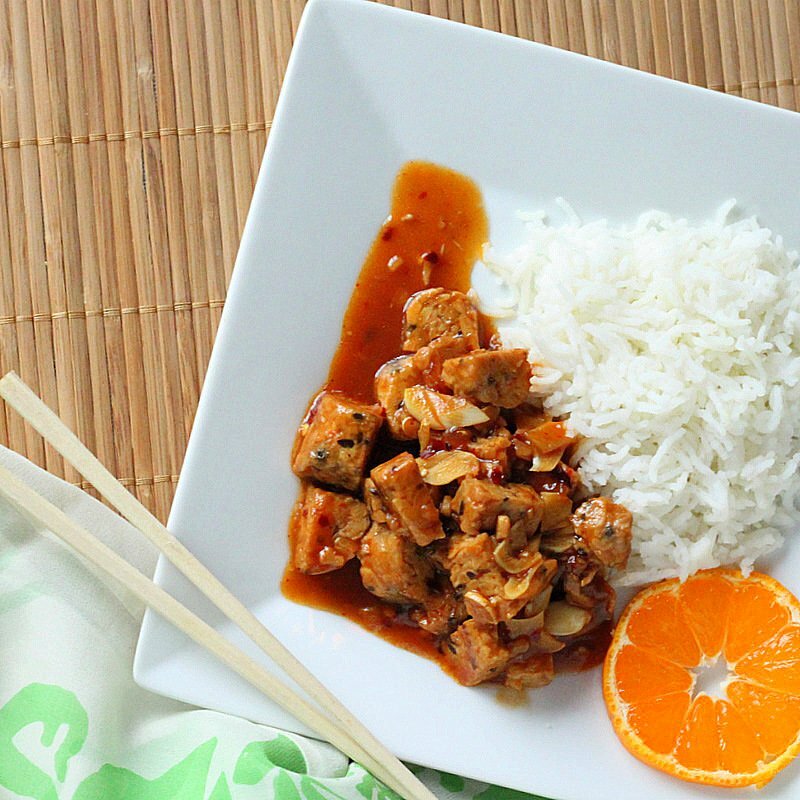 I think I could even get my guy to eat Tempeh with the awesome General Tso sauce. YAY! Oh I can’t wait to try this. I LOVE tempeh, and am always looking for new recipes to use it. I can eat it cold, right out of the package. Good stuff! 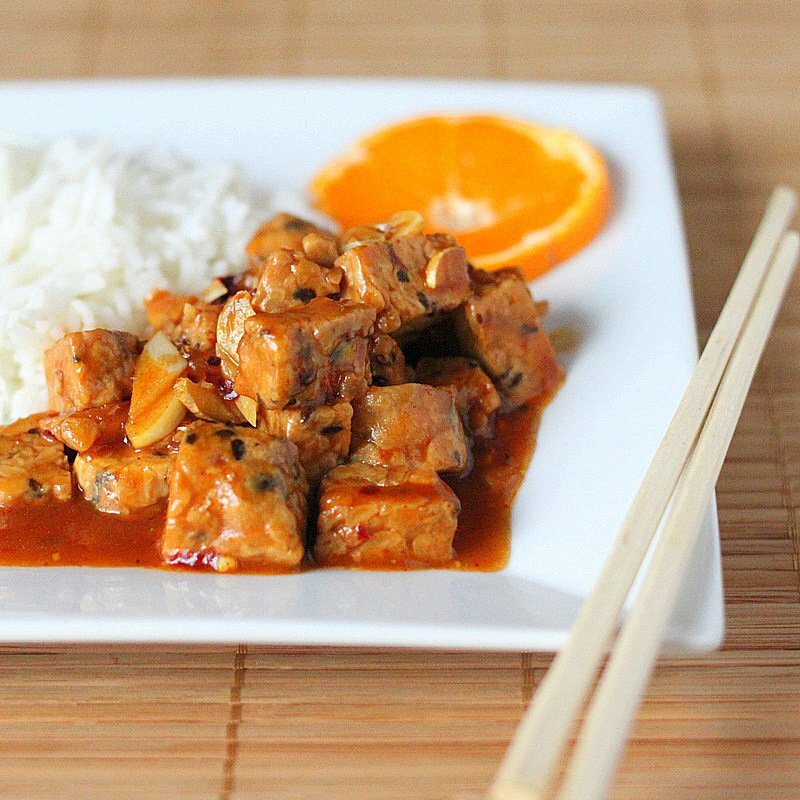 This tempeh reminds me of sweet and sour tofu! I’m going to try this soon D. I just had tempeh a couple of days ago from a Muslim stall. It was cooked in sambal chili and tomato paste. Delicious! I can imagine how your recipe tastes! Thank you Reshmi, Priyanka and Aarthi! Haha Gigi, I think mom is currently enjoying herself with all 3 nagging children out of the house. No more kid duty for her! Thanks Soni, do let me know when you do! So true Cara. So much man made debris polluting every possible inch. Thank you aDessertDiet, I need to try that sambal chili tempeh! Lovely and appetising dish! I haven’t had tempeh in a very long time. I will have to remember to pick some up when i’m next in chinatown! Delish General Tso recipe! Must try! Thanks for sharing the citrus love! After all my years as a strict vegetarian, tempeh is the only soy product I liked (loved, actually). This recipe sounds so wonderful! Since I’m questioning the quality of the local chinese food restaurants lately, I’ve been trying to accumulate recipes for my favorite dishes so I can make them at home. General Tso is at the top of that list. Thanks so much for sharing this recipe! I also don’t do much soy, but I love tempeh! This looks so good!!! I am making it tonight. I have to try making tempeh this way. It’s looks delish! Its ok but we felt its definitely lacking that deep general tsos taste. Added more hoisin, sugar and red chili paste + some sesame seeds. Thanl you Elizabeth, Sylvia, [email protected]! Deeps, Tempeh is fermented soybean patty. you can use tofu too. Thanks for trying it out Jeff and thank you the feedback. My tastes are a bit milder..I am glad you adjusted the sauces and made it your own! Turned out really good, although not necessarily what I would describe as the typical “General Tso’s”… This was less sticky and sweet. But good. Also, I did have to add more cornstarch, and seeing that the sauce called for so much water, I scaled that back by about half. All in all, very successfully tasty, though. Thank you for trying it out Andrew and the feedback.. I corrected the water content for the sauce. It is a bit different that the real gen tsos. a less oil and thinner sauce version! Many Chinese dishes are very oily, heavy, and are focused on flavor. I personally like the taste of tempeh, so this recipe was perfect for me! I didn’t have any hoisin sauce or ginger, but I used a miso ginger paste. Since I doubled the recipe (for 8oz of tempeh), I used a whole garlic bulb (I really like garlic!). I added less than a half cup of water and 2 tablespoons of cornstarch. The result? A delicious, flavorful tempeh stir fry! The sauce was thick like the Chinese dishes I would order at restaurants and the flavor was not overbearing. It was so delicious, thank you for this recipe! I served my tempeh over black lentils and steamed vegetables! Yum! Thank you for trying it out and liking it!.. I like mild flavors and less oily chinese food too! I made this for dinner tonight and it’s so tasty! Really recommend! Easy and quick.